In Fuel for Biofuels part 1, I took a look at producing biofuel from corn. This has come to be known as first generation biofuel. The next generation biofuels can be produced from cellulosic feedstocks and by aquatic algae. In this part 2, I'm going to take a look a cellulosic feedstocks. In an attempt to make the posts more digestible, I'm going to make them shorter and hopefully more frequent. Previously we learnt that corn is a commercially popular feed stock because it is easily broken down having a relatively simple structure and requiring simpler chemical and enzymatic degradation processes. Cellulosic ethanol feedstocks include sawdust, forest thinnings, waste paper, grasses, farm waste (e.g., corn stalks, wheat straw, and rice straw), switchgrass and other perennial grasses. Where is the cellulosic material found in plants? There are many differences when plant cells are compared with animal cells, such as the presence of chloroplasts and a large central vacuole but the difference we are most interested in, is the cell wall which animal cells lack. 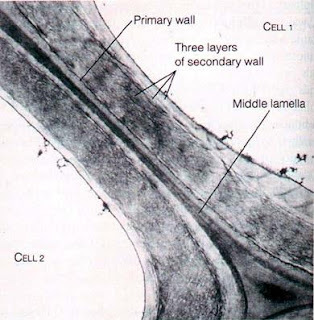 The cell wall is one of the features of plants that gives a plant rigidity. The food generating cells of leaves have a thin cell well and these cells are known as parenchyma. The cells that make up young flexible stems are known as collenchyma. Their cell walls are thicker particularly at the corners where several cells intersect. The thicker the cell wall the less nutrients can get into the food production centers but collenchyma cells despite their thicker cell walls, are still alive. 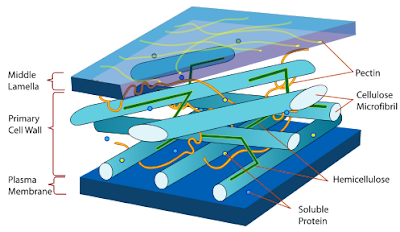 The cell wall consists of cellulose, hemicellulose and pectin. Collenchyma cells are able to stretch as the plant grows. Figure 1 illustrates the plant cell wall structure. You can see that the cellulose is arranged in microfibrils and a magnified illustration of a microfibril is shown in figure 2. The highly regular formation of the fibrils can easily be imagined (curiously it reminds me of the highly structured formation of skeletal muscle). Hemicellulose links the microfibrils together. In figure 1 cell wall illustration, you can also see a molecule called pectin. Pectin is another polysaccharide and works to both give mechanical strength to the cell wall and to improve impermeability. Figure 2 Structure of cellulose microfibril (link). To the inside of the primary cell wall in these cells, a secondary cell wall can be laid down and toughened by the deposition of lignin. Lignin is water impermeable and is very rigid, with great mechanical strength; without water the cell cannot survive and dies. This layer of cells becomes known as sclerenchyma. We are interested in the structure of these polymers because they will affect downstream processing of the cellulosic materials for biofuel. Cellulose consists of glucose monomers linked together by C1 and C4 as shown in Figure 4. The number of glucose units can be in the 10,000s and its regular structure allows it to pack tightly together giving strength. Hemicellulose on the other hand is amorphous and flexible with little structure strength. 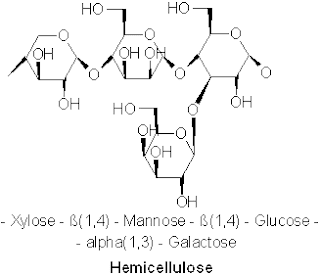 Hemicellulose consists mainly of 5 carbon sugar monomers such as xylose, mannose, galactose, rhammnose and arabinose. Figure 5 shows a picture of a common hemicellulose repeating unit with the different pentose sugars. Pectin, like hemicellulose, also consists of several different monosaccharides and illustration of pectin is shwon in figure with the different regions shown in blue and the monosaccarhides illustrated as small differently coloured polygons, and the key to the polygons is given in the figure. Lignin is unusual in a structural polymer in being very irregular. It consist of three molecules called monolignol monomers: p-coumaryl alcohol, coniferyl alcohol, and sinapyl alcohol. Different plants have lignin with different proportions of each molecule. Figure 6 shows an example of a possible lignin structure. It makes me think of lace. Figure 6. Example of possible lignin structure. So, wow, thats a bit more complex than the starch nolecule of corn. Interesting, the difference between starch and cellulose, both of which consist of chains of glucose molecules is the way in which the monomers are linked. In starch, animals have enzymes that can easily digest the link while they do not have the enzymes to easily digest the cellulose chemical links. How do we turn the complex structure of plant cell walls into biofuels? See the next post!